The party people from Lima were still sleeping it off, or maybe they had just gone to bed, so I was alone at breakfast in San Bartolo, on the coast of Peru. A steady stream of staff brought bags of fresh produce to the kitchen from the market across the street, and a 16 year old delivered two propane tanks on the back of his 125 cc Honda motorbike, improvised straps tenuous on the dented tanks. I couldn’t hear for sure, but I think the music in the kitchen was Wyclef and/or Beyonce. A trill on a little wood pan pipe announced the arrival of the sinewy man with a wheeled contraption, a cross between a unicycle and a wheelbarrow. He paused, and when two cooks came out of the kitchen with large knives in their hands, he flipped the thing over and quickly set up shop. A pump on the foot pedal set the main wheel turning, a leather strap scraped the road crap off then connected it to the smaller wheel. Taking the first knife, he eyed the edge, tested it with a thumb, then set to sharpening it on the spinning grindstone, the sound of scraping metal oddly soothing in the morning air. I wanted to know this man. To take his picture. It was Day 2 of the trip though, so my nerves were still a bit shaky. “How do you sharpen knives in the US?” He might ask me. “There’s either a sharpener in the knife block, we do it ourselves (usually poorly) or we just kinda…you know…buy a new one?” I didn’t want to admit that. And what if he thought I was a jackass tourist? What if I was? But there’s no space for missed opportunities anymore, so before I could talk myself out of it, I grabbed my bag and approached him. I used the absence of mosquitoes as smalltalk, saying I wanted to move here. Tangential compliments are always a good way to go, no? He focused on his task while I snapped a couple quick shots, his leg, which must be harder than the steel he sharpens, never slowing as it pumped the foot pedal that earns him a living. We talked a little while he finished, and once his hands were free, I handed him a few soles, which he accepted with a slight nod. He went on his way, and I returned to my table, where my breakfast was waiting, a dry bread roll with a thin slice of cheese. The radio was playing Rihanna, you can stand under my umbrella. Very nice capture of the guy…loved the colors and the expression on his face. So are your enjoying the trip to Peru so far? Thank you! I didn’t want to wag the camera in his face for too long, so grabbed a half dozen quick ones and hoped they would suffice. Peru is fantastic, why did I leave it so long? It’s dangerous though…I am determined to go home, but the endless trip is calling again/still…so much more to see! Nice little slice of local life down there. It’s the little things that fascinate me. Some places you just buy a new one. 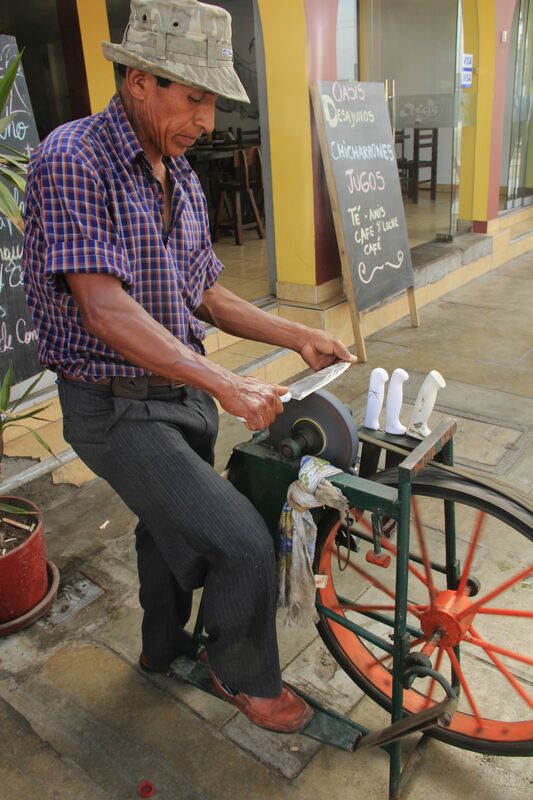 Other places the economy supports this whole knife sharpener. Exactly! And at first I thought he was the only one, but I saw several of these dudes throughout my time there. 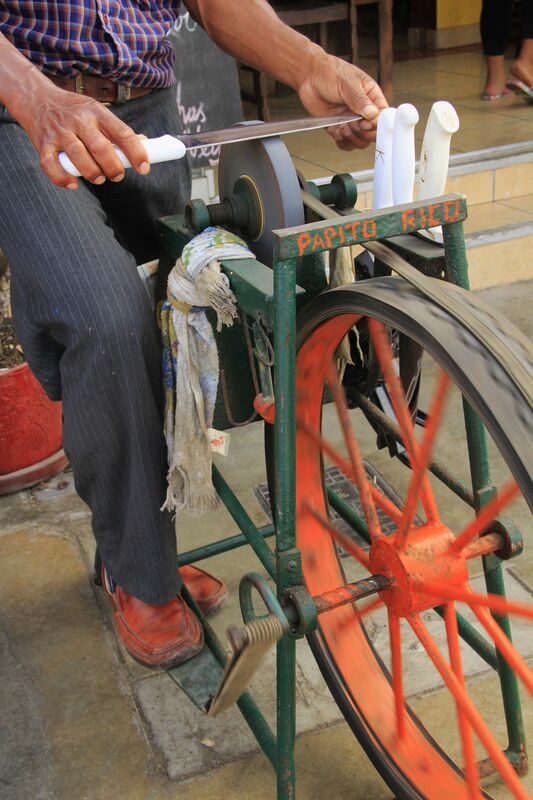 Viva the dude with the old-school wooden knife sharpener cart! I am also a vagabond, but unlike you in mind only. It would be fantastic if I could do it physically like you. I have made it actually through your post. Thanks, thanks for it. Mmmm, miss those decadent Peruvian breakfasts of white bread roll and watery juice that they claim is safe to drink.